The Bishop brothers were descended from UEL stock, their family settling in Augusta Township, where they ran a mill. They also had connections to the Bukers, whose family ran a successful sawmill in Wolford Township. Eventually, the brothers discovered the part of the Middle Branch that would be ideal for building their mills. 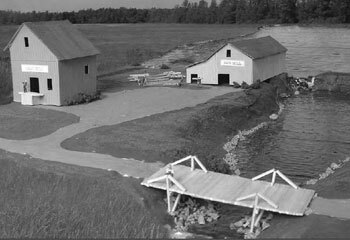 The model shown at right shows how the mills may have looked adjacent to the earthen dam at the peak of their operation around 1865. Once the Bishops brothers, Chauncey and Ira, decided on the best site for their original mill, a dam was built across Little Creek, or Middle Creek, as it is known, and this produced a rather large millpond. The saw and shingle mills, and later a grist mill, were all built of frame construction, two storey structures with cribbing underneath to allow the water to flow through. Unlike other villages whose mills were constructed of available stone, many still standing, the Bishops’ mills were made of what was most plentiful – wood – and as they later fell into disuse, today there is no trace of them. The remains of the earthen dam can still be seen. Moses Waldron was the first storekeeper in Bishops Mills, who came to the area from London, Ontario, about 1860. The village was still rapidly growing, and by 1879, according to the History of Leeds & Grenville, Waldron was operating “…an extensive mercantile business.” Waldron was active in the Canada Methodist Church and is said to have been instrumental in bringing postal and telegraphic facilities to the village. 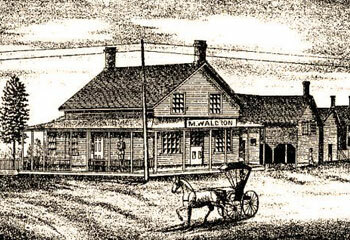 In 1879, Moses Waldron died, leaving his widow to run the business. George Ferguson, a schoolteacher who had been a clerk for Waldron, married his widow, and with the help of his young nephew, Jack, took over the operation of the store. 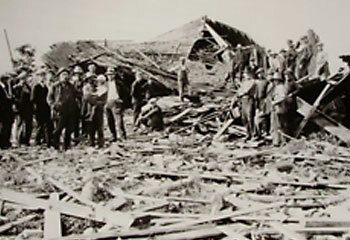 Tragedy struck the village at 6 a.m. the morning of August 12, 1924. Stanley Watts was cheesemaker at the time. The boiler used to process the cheese was accidentally allowed to boil dry, and the pressure caused an explosion that was heard for miles in all directions. Watts was fatally injured, and a cheese inspector and young boy were also killed. The building was levelled and the remains of the boiler were found in the next field. ESTABLISHEDca 1840 when brothers Chauncey and Ira Bishop built a sawmill and grist mill on the Middle Branch of the Rideau River. The arrival of industry quickly attracted blacksmiths, a cheese factory and general store - and early settlers such as the Bukers, McLellands, Snowdons and Hutchins.